Dog ticks are a common problem for all animals especially your dog as they are often out and about. Ticks have four stages of life: egg, larva, nymph and adult. After the egg hatches the larva feeds on any suitable host, then develops into the larger nymph which also feeds on the host and finally develops into the adult, the female will often lay eggs after feeding, some ticks can lay up to 10,000 eggs at one time. Dog ticks are one of the most efficient carriers of disease, as they attach firmly when sucking blood. They feed slowly and may feed for several days if not removed. As the tick feeds on the blood it gets bigger and may look like a mole,it can get as big as a pea. Ticks can only crawl they cannot run, fly or jump, ticks will wait on the tips of grass, weeds or small shrubs when a suitable host brushes against the plant they let go and climb on to the animal or person. Keep your property tidy, lawns cut short, weeds cut out, shrubs trimmed, ticks stay low to the ground so they do not usually get up in to trees, areas adjacent to your property that have ticks apply a suitable insecticide to vegetation. If you have a problem with tick infestation in the home or on the property you may need to call a professional pest control company. Treat you dog and all other animals with a tick control product regularly. There are some flea treatments that provide tick control like Frontline Plus but only has control for the first month and flea control for 2 months. Use a fine point tweezers or a special tick removal instruments. Do not grasp the tick by the body, rather by the head or mouth parts right where they enter the skin. Do not twist or jerk while pulling the tick as you may break the tick’s body and risk leaving it’s head behind. Pull firmly and steadily directly outward. It may take a few minutes but steady as you go. Using methods such as applying petroleum jelly, a hot match, or alcohol will NOT cause the tick to 'back out.' In fact, these irritants may cause the tick to deposit more disease-carrying saliva in the wound. After removing the tick, place it in a jar of alcohol to kill it. Ticks are NOT killed by flushing them down the toilet. You can also freeze the tick. Clean the bite wound with a disinfectant. If you want to, apply a small amount of a triple antibiotic ointment. It's not uncommon for a welt and skin reaction to occur. A little hydro-cortisone spray will help alleviate the irritation, but it may take a week or more for healing to take place. Some cases, the tick bite may permanently scar leaving a bald patch area. This skin irritation is due to a reaction to tick saliva. The Tick Twister is the safest way to remove ticks without leaving mouthparts of the tick planted in the skin. Takes the tick away quickly and painlessly. Does not squeeze the tick and reducing the risk of infection. Designed by a Veterinarian. Tick is extracted by rotation and a slight upward motion, not by pulling. With the Tick Twister you don't pull on the tick. Instead you rotate the tick and use a slight upward motion until the tick detaches after 2-3 rotations. If your dog does get a tick bite and you are concerned put the tick in a Ziploc bag with damp cotton wool or paper towel , in case you need it identified, your local health department will assist with identification. In the United States there is about 200 different tick species some can transmit diseases when they bite. Two of the larger and more common ticks in USA are the Brown Dog Tick, American Dog Tick, there favourite host is the domestic dog. Rocky Mountain Wood Tick as the name suggests is common in the Rocky Mountain area. Groundhog Tick is found mainly in the New England states. 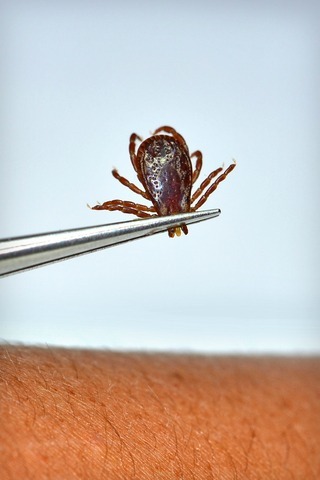 A very small tick called (deer tick) is known to carry Lyme disease which can be very serious if not treated promptly. It depends on the area you live in as to the dog ticks present inquire from your vet, you need to be aware of any particular danger. For further information about ticks check out pest products.